Injectable fillers can make thin lips plumper, enhance superficial contours, smooth facial creases and wrinkles or improve the appearance of shallow scars. There is a minimal amount of discomfort associated with the use of injectable fillers and they are considered safe and effective. Forehead Lines: Horizontal lines appearing on the forehead. Also known as worry lines. Frown Lines: Creases that form between the eyebrows over time. Also known as glabellar lines. Periorbital Lines: Lines which radiate outward from the corners of the eyes. Also known as crow's feet. Smile lines: The lines which run from the sides of the nose to the corners of the mouth. Also known as nasolabial folds. Oral Commissures: The lines that extend downwards from the corners of the mouth. Also known as marionette lines. Vertical Lip Lines: Fine lines which form on the upper lip. Also known as smoker's lines or perioral lines. here are a number of substances that can be injected as fillers including collagen, hyaluronic acid, hydroxyapatite, polymethylmethacrylate microspheres, polylactic acid and even a person's own fat. Often these fillers are used in conjunction with BOTOX injections to reduce the appearance of fine to moderate facial wrinkles. Collagen is perhaps the most well-known injectable filler. Collagen is a protein that is found naturally in human skin, joints, and tissues. As we age, collagen breaks down and is not reformed as readily as it once did, leading to laxity of the skin, wrinkles and thinness. Collagen injections attempt to temporarily reverse this thinning, tighten and restore the skin of the face. Collagen that is derived from human skin is marketed under various names such as Cosmoderm® and Cosmoplast®. Other types of collagen are derived from bovine (cow) sources and are sold as Zyderm® and Zyplast®. Currently, human collagen is extracted from donor tissue and highly purified. Human-derived collagen has some advantages over bovine collagen but it is more expensive. Recent research has shown that it is possible to create synthetic human collagen in a laboratory and may reduce the cost of human collagen injections in the future. Hyaluronic acid is also naturally occurring in humans but is closer to a carbohydrate (think sugar or starch) than a protein. It is one of the newer injectable fillers and is used to smooth fine lines and wrinkles. Hyaluronic acid is marketed under the brand names Juvaderm and Restylane though newer products include a local anesthetic (Juvaderm Ultra Plus and Perlane) are more comfortable for patients. Hydroxyapatite is not a protein but rather a mineral, similar in composition to the substance found in bones. This injectable filler is suspended in a gel and has more bulk than other fillers. Hydroxyapatite is sometimes used to fill deep furrows, scars and wrinkles. This substance may also be used to raise the skin along the jaw line and chin when a full facial implant is undesirable. Polylactic acid is the newest injectable filler on the block and has a unique mechanism of action. When the substance is injected into an area, such as a wrinkle, it stimulates the skin to produce its own collagen in that area. Thus the collagen that forms is presumably more natural and longer lasting than transplanted collagen. Currently Sculptra® is used in patients with HIV-related loss of skin fat but may be used by some physicians "off-label"..
Polymethylmethacrylate microspheres (ArteFill and Radiesse) are used in conjunction with collagen to fill facial wrinkles. The biggest advantage of using microspheres is that they resist absorption and digestion by the body and therefore last longer. Perhaps the safest injectable filler uses fat harvested from another part of the body. In this procedure, gentle liposuction is performed on an area such as the belly or thigh. The harvested fat is cleaned and purified and only whole fat cells are used (typical liposuction liquefies and destroys the fat cells). The clean, purified fat is then injected into specific trouble areas on the face. Each injectable filler has its advantages and disadvantages. Speak with your plastic surgeon to determine with filler is right for you. Collagen is a natural protein. Injectable collagen (Cosmoderm, Cosmoplast is derived from human dermis . The use of bovine collagen (Zyplast, Zyderm) requires pre-treatment allergy testing. Hyaluronic acid (Restylane, Juvederm ) is a natural substance found in the human body. These are the most common fillers in use today. They last ingeneral between 3 months and a year. Hydroxylapatite (Radiesse) is a mineral-like compound found naturally in human bones. It is slightly more expensive than Hyaluronic acid but can last several years. Human fat is harvested from the patient's own body. It is the most natural filler that we know of because it is your own tissue. The two downsides however, are that fat harvesting to inject requires a trip to the operating room and fat is a bit unpredictable in how much will eventually survive after injection. Q. Could I be a candidate for dermal fillers ? This procedure is not permanent and thus this is not for those who are seeking a more long-term solution to their ageing skin. However, as long as you pass the initial surgical assessments, dermal fillers can offer a real solution to skin problems for a variety of people and results often last for up to 16 months. You should also enquire as to the ingredients of the specific dermal filler which would be used in your procedure; some patients may find that they are allergic to certain injections and many patients will likely want to find some of the ethical injections which are now available. Q. What does treatment with dermal fillers involve ? Treatment usually involves the application of local anaesthetic cream to the treated area or a nerve block prior to injection. 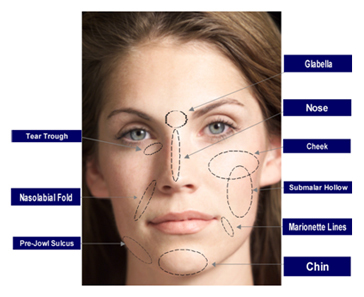 The dermal filler is then comfortably injected into the treated area to fill out the line, wrinkle or fold. There is usually some transient redness after the injections. Swelling is also present after the procedure, especially with any lip enhancement procedure. Swelling is usually only a problem when performing lip enhancement, and this can last for up to 2 weeks. Swelling of other areas post-treatment tends to temporarily enhance the effect of the dermal filler, and it often takes 3 days to see the actual real improvement without swelling. Bruising can also occur, and if it does, it can take a week to heal. Make-up/lip stick can be worn (if applicable) soon after treatment should there be a need. Asymmetry is also possible, but correctable on a subsequent visit. Small lumps can occur, and these will either disappate in a few weeks, or may require reversal with hyaluronidase. Treatment with dermal fillers sometimes does take more than one session to get the best results. The first treatment lays the foundation for the subsequent treatments, and future treatments allow for any adjustments to be made. Note that if you have a history of cold sores and the treatment area is around the mouth, then you should notify your treating doctor. You may be instructed to take anti-viral medications prior to treatment if this is the case. About 10 to 20 minutes per session, depending on the individual and the amount of areas being treated. Before receiving treatment, patients may need to undergo a skin test. This can help to prevent complications; however, some of the most common side effects include: allergic reaction, bruising at injection site, numbness, and temporary redness, swelling, pain/tenderness, or discoloration. Injectables require very minimal downtime, allowing patients to return to work and their normal activities directly following treatment. Yet for the first 24 hours, individuals may be instructed to refrain from strenuous activities and excessive sun or heat exposure. Q. Are There Risks Involved ? Complications from injectable fillers are rare. As with any procedure, there are some side effects that may occur. Infection at the injection site, bruising, and swelling are all possible. There can also be redness, itching and skin sensitivity. The results of a procedure using injectable fillers are immediately apparent. Any mild swelling or bruising can be alleviated with a cold pack and should improve within hours or just a day or two. The options available for injectable filler treatments are many. It is important to seek out the services of a highly trained and qualified plastic surgeon who will discuss your procedure with you and what you can expect. Q. Will it really work? And will I really look any better ? Derma Fillers offer solutions, not just for wrinkles, but also to improve the volume of thin lips or return plumpness to facial contouring. Patients will find their confidence greatly improved and, as long as patients attend regular top-up appointments, the improvement should be long-lasting and completely change the way you feel about your age. These injections are living proof that age is only a state of mind and many patients have been able to wipe years off their faces. Call to book an appointment with your chosen surgeon and they will be able to talk you through whether dermal fillers are the correct procedure for you. If it turns out they aren't, then there are many other options available to you.